MOSCOW, November 8. /TASS/. The project of Greater Eurasian Partnership is open to new participants, Russian President Vladimir Putin said in an article for the media of APEC nations ahead of the APEC Economic Leaders' summit in Vietnam on November 10-11. "I would like to mention our idea to create the Greater Eurasian Partnership," Putin said. "We suggested forming it on the basis of the Eurasian Economic Union and China’s Belt and Road initiative. To reiterate, this is a flexible modern project open to other participants." Putin has reminded that the Greater Eurasian Partnership is created on the basis of the Eurasian Economic Union and Chinese initiative One Belt, One Road. Comprehensive development of infrastructure, including transport, telecommunications and energy, should lay the foundation for effective integration, he said. Modernization of Russian sea and air hubs in the Far East is in full swing, he said. In addition, Russia is developing transcontinental railway routes and building new gas and oil pipelines. "We are committed to implementing bilateral and multilateral infrastructure projects which will link our economies and markets," Putin said. "Among other projects, I am referring to the Energy Super Ring that unites Russia, China, Japan, and the Republic of Korea, and the Sakhalin-Hokkaido transport link." "We pay special attention to integrating Russia’s Siberian and Far Eastern territories into the network of APR economic ties," he said. "These efforts include a whole range of measures to enhance the investment appeal of our regions, and to integrate Russian enterprises into international production chains." For Russia, the Far East growth is a "national priority for the 21st century," he said. "We are talking about creating territories of advanced economic growth in that region, pursuing large-scale development of natural resources, and supporting advanced high-tech industries, as well as investing in human capital, education and healthcare, and forming competitive research centers," the president said. 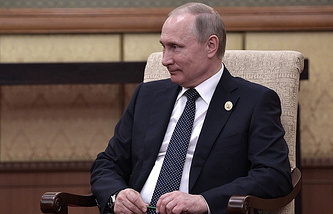 "We hope that our foreign partners, primarily from APEC economies, will play an active role in implementing these programs and projects," Putin said. "All the more so, as foreign participants of the annual Eastern Economic Forum held in Vladivostok already had a chance to gain confidence in the prospects and feasibility of our plans."